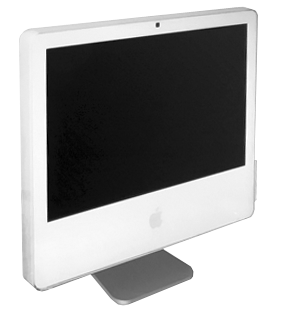 Apple has begun referring to this model as the iMac (Early 2006), but we're calling it the iMac Core Duo. Three months ago Apple introduced an updated iMac G5 - slimmer, lighter, a bit faster, with iSight built in, and sporting a remote control. Now they've replaced it with essentially the same computer, but this time with an Intel Core Duo CPU instead of a single-core PowerPC G5. At the Macworld Conference and Expo on January 10, 2006, Steve Jobs announced that the new iMac would be the first Macintosh to use an Intel CPU, the Core Duo. The introduction of the new iMac along with the Intel-based MacBook Pro signaled the start of a six month transition from PowerPC to Intel processors. 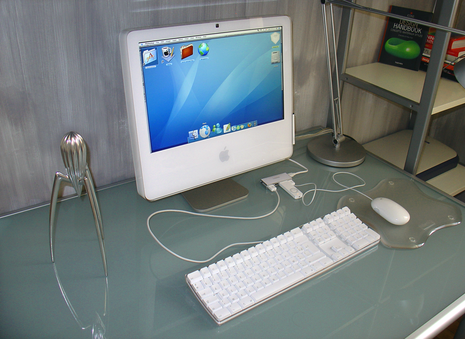 The features, price, and case design remained unchanged from the iMac G5. The processor speed, however, according to tests run by Apple using SPEC, was declared to be two to three times faster than the iMac G5.